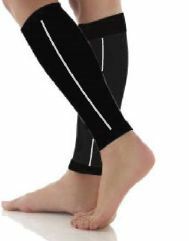 Doctor's Choice Compression Calf Sleeve *** DISCONTINUED *** | Doctor's Choice Compression Calf Sleeve with Graduated Compression. Provides relief from leg fatigue and swelling. Doctor's Choice Compression Calf Sleeve with Graduated Compression. Provides relief from leg fatigue and swelling. Doctor’s Choice health related products are designed with precision and with graduated compression. The control combination of nylon / spandex provides firm therapeutic assistance for all day support. These products help blood circulation and help relieve discomfort due to swelling, fatique and other related problems. Doctor's Choice compression calf sleeve provides relief from leg fatigue and swelling. It also increases the blood flow and circulation.